SAINT JOHN, N.B. -- Legal watchers in the Maritimes expressed surprise over Saturday's murder conviction against a member of one of New Brunswick's most prominent families, with one expert forecasting an appeal. 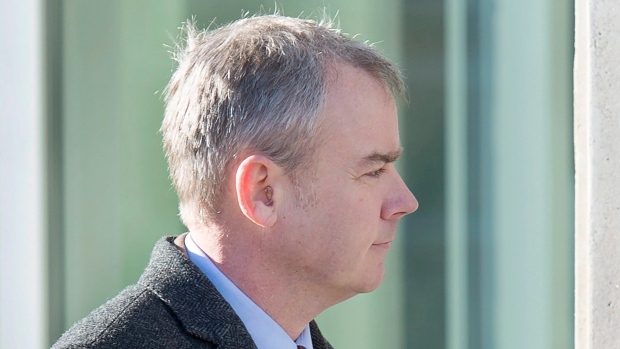 A professor of criminal justice history who has been following the trial of Dennis Oland said he was shocked a jury came back with a guilty verdict. Greg Marquis of the University of New Brunswick, who is writing a book about the Oland trial, said the evidence presented at the trial was largely circumstantial. Marquis pointed out that Judge John Walsh emphasized in his legal instructions to the jurors that they could not convict Oland second-degree murder in the death of his father Richard Oland unless they felt his guilt was proven beyond a reasonable doubt. Marquis said if he had been on the jury he would have struggled with that concept in the light of evidence available, which included a brown sports jacket with some blood stains found on it. "There was not a lot of direct evidence. There was no murder weapon or witnesses," he said in an interview on Sunday, a day after the jury handed down its verdict of guilty of second degree murder. "There was hardly any blood evidence, except for on the brown sports jacket. That was a key piece of forensic evidence but even that is problematic because no one could say how the blood got onto the jacket or how long it had been there." Oland's mother Connie has issued a statement maintaining her son's innocence and said they would be discussing options with the prominent New Brunswick family's legal team. Robert Currie, a criminal law professor Dalhousie University in Halifax, predicted Oland will appeal the conviction. However Currie said Oland's avenues for an appeal are limited because the jury's deliberations are kept confidential, so there is no written decision to dispute as there are when a case is tried by the judge alone. Appeals in jury trials are usually limited to the judge's instructions to the jury or the admissibility of evidence, said Currie. He predicted Oland would appeal the decision to allow the brown sports jacket as evidence at the trial. Oland was wearing the jacket when he visited his father on July 6, 2011 -- the day before he was found face down in a pool of blood in his Saint John office. The DNA of the blood stains matched the profile of Richard Oland. The Oland family is one of the Maritimes' best known families and founded Moosehead Breweries.